ROSE OF THE YEAR 2019 - A new climbing rose showing exceptional health and outstanding disease resistance. Pure white flowers with a subtle spicy perfume, open to reveal yellow-tinged stamens - adored by bees. Producing large clusters of delicate blooms, it flowers prolifically and repeats throughout the season. This rose came top in a 2 year trial and was voted as Rose of the Year 2019, so you can be assured this is a great new rose. Flowers July-September. Height 250-300cm (8'2"-9'9"); spread 250-300cm (8'2"-9'9"). 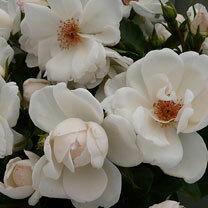 For over 130 years the Harkness nursery has been supplying roses to Britain's gardeners. The mission of Harkness Roses is to raise new and improved roses, varieties with better reliability against disease, stronger perfume, a wider range of colours, and more blooms over a longer flowering period. Of these qualities, perhaps the most significant is 'reliability'. Ideal for beds and borders. Scented. Attractive to bees. Grows well in sun or shade.